I’ve been exploring the chakra energy system for years. Although I’ve been learning about it mostly through the system of yoga, I realize that there are many other names for this energy system. From indigenous healers to Tibetan Buddhists, these energy centers are universal when it comes to understanding the body and the energy body. I’ve compiled this information for a workshop that I teach. And, I wanted to share with my blog community the handout I offer those in class as well as some thoughts I have on the chakra energy system. The bottom three chakras are the homes for some of our deepest wounds: fear (1st chakra), guilt (2nd chakra), and shame (3rd chakra). Considering that the bottom three chakras are about empowerment and the upper three chakras are about enlightenment (the 4th chakra, the heart chakra unifies the upper and lower)…it’s spiritually necessary to go into these wounds and transform them with healing awareness. Each chakra also corresponds with specific endocrine glands and participate in the complex dance of hormones in our bodies. Hormones, which are basically chemical messengers, are secreted into our bloodstream and can stimulate or inhibit certain physical processes. In that way, it is natural to consider that chakras and their corresponding glands can become deficient or excessive. Years ago I took a workshop with Anodea Judith. She taught me that the nadis (small, filament energy pathways throughout the body, of which there are thousands) inform the chakra energy system. Yoga asana (postures), mantra (sound vibration), and pranayama (breath-work) practices work on the nadis and the chakra energy system. Understanding the chakra energy system allows us to get a window into the workings of our energy body and our soul/psyche. This statement is written on my master copy handout on the chakra energy system: “everything begins with making subconscious information => conscious.” It is with this in mind that the intersection of yoga, depth psychology, physiological wellness, and dream-work becomes apparent. I hope you enjoy the handout I have posted below! A little note on the bija mantra (seed-sound mantra) in the information below. I have a dash where the vowel is supposed to be because the vowels are actually a bit disputed. The bija mantras were brought to the US just about 30-40 years ago and were all taught to be the “ah” sound. However, Christopher Tompkins, a Sanskrit linguist is disputing that. So, in that case, I have put the alternative vowel sound in parenthesis. 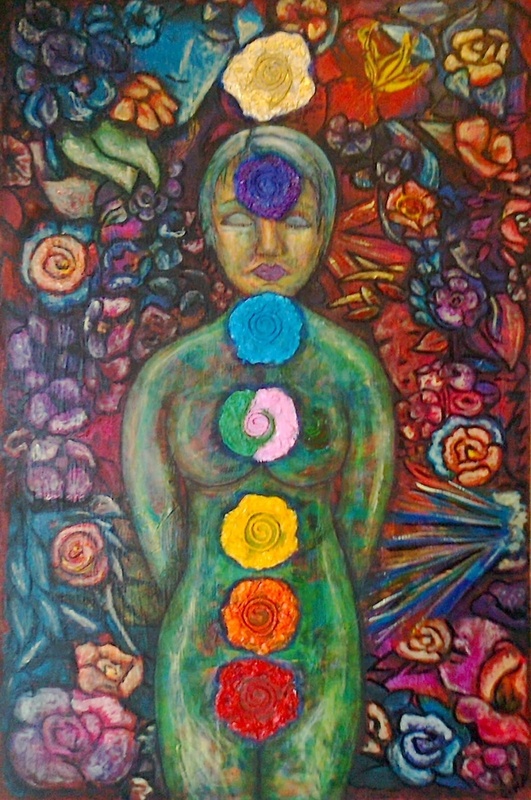 Chakra means “wheel” or “disc” in Sanskrit; the chakra energy system is a “rainbow bridge” between heaven and earth (connects mother earth to father sky or the material with the spiritual). Thank you for sharing ❤ I love reading more thoughts on the Chakras. Wonderful ~ feel free to share any additional info, insights, personal experiences, or links… Blessings! Excellent ~ yes, please share when it is ready!